Using decorative stone is a great way to create visual interest while bringing in more texture, color, and even dimension to the design. Landscape design is all about enhancing the beauty and function of the exterior space around your Aberdeen home. Whether that means installing new lighting, sprucing up your trees and garden features, or creating a path from your driveway to your door, you want to enhance the curb appeal of your property while making it work more efficiently for you and your family. Using decorative stone is a great way to create visual interest while bringing in more texture, color, and even dimension to the design. Here are some ways you can use decorative stone for your landscape. Install stone walls and arches to diversify your garden spaces. You can even use these features as seating areas or retaining walls. They create more levels around your landscape and could even serve as a way to mark an entry point to your garden or other areas of your yard in Aberdeen. You can also use the decorative stone to resurface your driveway. You can create a rustic look or bring in more sophistication or even edge with the stone design that you choose. The stone also doubles for its convenience because the maintenance is minimum and the surface it creates is smooth. 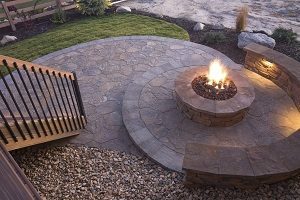 Stone is a great choice for creating both fire and water features. For fire, your new decorative stone is a resilient material that can withstand high heat while creating a beautiful atmosphere. You can use it to create a fire pit or even outdoor oven for family cookout time in the summer. Similarly, decorative stone for water features creates a smooth surface that will allow the water of a pond, fountain, or waterfall to ripple peacefully through your Aberdeen landscape. Decorative stone doesn’t always have to serve a specific function in your landscape. If you are a fan of art, it’s also a great choice just for adding more visual appeal, Use it to act as an accent for other features in your yard, including near your seating or to outline a pathway. This entry was posted on Friday, June 15th, 2018 at 9:11 am. Both comments and pings are currently closed.